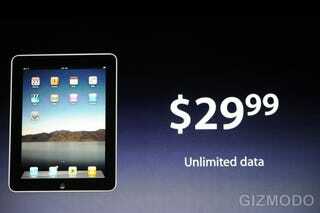 Which iPad 3G Data Plan Should You Buy? When Apple's iPad 3G ships in April, U.S. wireless partner AT&T will offer two data plans for the gadget, with different costs and monthly download allotments. Specifically, AT&T will offer a $14.99 monthly plan that allows for 250 MB of data consumed, and a $29.99 monthly plan that allows for unlimited Internet consumption. Remember, using the iPad in a wi-fi zone doesn't count toward this limit. So if you're going to be using the iPad primarily at home—the best use case—or at the office, or anywhere there's wi-fi, you won't need to worry about hitting the 250 MB cap. AT&T is also including free access to its wi-fi networks in its 3G plans, which includes Starbucks locations. What happens if you go over 250 MB? Will AT&T stick you with unreasonable overage charges? But our hunch, because this is prepaid service — no contract or credit check required — is that once your 250 MB are up, AT&T's network meter will simply require you to upgrade to the $29.99 plan to continue using the Internet. This seems the more consumer-friendly, responsible thing to do, and eliminates AT&T's risk of offering you credit. But AT&T refuses to immediately give more information than what Jobs said in his presentation. So we can't be sure.